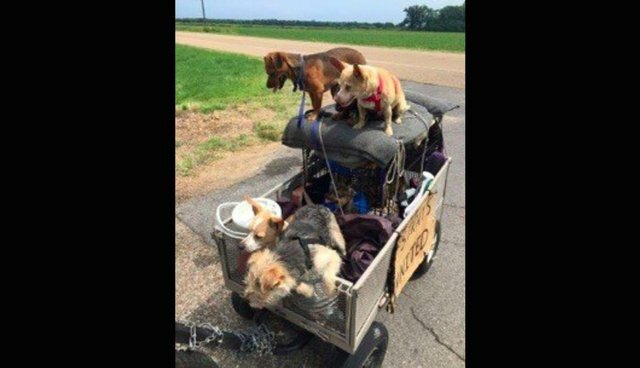 A man and his 11 dogs began a journey across America with nothing other than a bike, a cart and a sense of family. Now, more than 2,000 miles later, the family is still going strong and they finally have a home to call their own. In 2001, Steve first joined the many other humans and animals around the world who are without a home. Since then, he has picked up any stray dog he has come across and welcomed them into his roaming family. Even without many financial resources, Steve still has plenty of love as well as an incredible ability to care for these dogs who would otherwise be abandoned. Over the past 14 years, Steve has cared for over 50 homeless dogs. At one point, Steve embarked on a journey from California to Indiana. Although some people in circumstances like Steve's might have abandoned their dogs at a shelter before moving, Steve refused to leave his dogs behind. With only a bike, a cart and his family of dogs, one of which was a mother with newborn puppies, he pedaled his way across the country. He kept pedaling for about 2,000 miles until he was spotted by a woman named Alicia Edrington. Edrington's mother, Mickey, sent out a call for help and gathered money to provide a night in a hotel room for Steve and his traveling dogs. The family took slumber party pictures. Little Trish, a former stray dog, got a loving massage from Angela of SOAR: Street Outreach Animal Response Initiative. And everyone got a good night's sleep before continuing their journey. Kerry from the West Memphis Animal Shelter reached out and purchased 100 pounds of dog food. People brought the family other dog essentials too such as leashes and harnesses. Even more people pitched in to get a second night in the hotel room for Steve and his pups. The Edringtons' call for help caused a ripples of generosity. Eventually, this ripple reached a Kelley Seaton, a kind woman from Tennessee, who offered to drive the family to their Indiana destination. The road trip offered plenty of time for a photo shoot. It was a cozy ride. Once the crew met up with Seaton, the ride went by quickly as they made their way to Indiana. They made a pit stop in Kentucky. Then got back in the car for the final segment of their odyssey. At last, Steve and all 11 dogs arrived in Indiana. Thanks to the GoFundMe account and the generosity of 197 people, the Edringtons were able to raise over $6,836. Additionally, Steve and his dogs will no longer be without a home, because one generous person donated a trailer to the family. On a small scale, Steve's story can be seen as one of rags to riches, but more importantly, it is the story of a man who had so little, yet still found so much to give: love, care and a sense of family. His generosity reminds us that although there are some things we can't control, we can always look inward to find a bountiful supply of kindness and compassion. Now, the Edringtons are hoping that enough funds will be raised to provide a small piece of land for Steve's new trailer. You can support Steve and his dogs by donating to the GoFundMe account here. CORRECTION: A previous version of this article said that Mickey Edrington was from the West Memphis Animal Shelter. She is not. Also, Mickey is not Alicia's father. She is her mother. Additionally, it was stated that the West Memphis Animal Shelter raised funds for a hotel room. In fact, they donated a 100 pounds of dog food. The GoFundMe number of donors and funds raised have been updated.